Although I was raised in Seattle, Wash., during the summers, when I was a youngster, I sometimes visited my mother’s family, who managed a farm in Downey, Calif. Three generations, my grandparents, uncle and aunt, and cousins, lived in an old wooden white two-story house. I enjoyed these summers: the warm Southern California sunshine was a nice escape from the Northwest rains, and playing with my cousins in the strawberry fields was more fun than practicing the accordion in my quiet bedroom in Seattle. My grandfather, Daisaku Murata, had very little formal education in Japan; I think he only completed the third grade. Like many Issei, or first-generation Japanese immigrants, his family was poor. I think he knew my grandmother’s family as they were neighbors in the same village. One of my relatives told me that after arriving in California, he worked for a railroad company, cooking for the work crew. Another relative told me that after the oldest child, Kenji, was born, O-jiichan delivered the rest of the babies. My grandparents eventually settled in the El Monte area, then Norwalk and Downey. The Murata clan grew strawberries, corn and other crops, and operated a roadside stand. Some of my summer vacations were spent with the family, sharing a bedroom in that old white house. The roadside business, Little Lake Berry Farm, was well-known for its fresh fruits and vegetables. I learned how to wrap and bag, make change, and carried the purchases to the customers’ cars. Sometimes I was given a generous tip. From those fun-filled summers, one particular memory continues to linger in my mind. After a long day in the hot sun and dusty crops, my o-jiichan, or grandfather, would take a relaxing hot bath. Just as he did when eating his meals, he took his time, never in a rush, enjoying each and every moment. Then, after putting on his yukata, or casual Japanese cotton kimono, he would put on his glasses and sit at a tiny desk in a very small, cramped closet. With a pencil in his hand and a sheet of paper in front of him, O-jiichan carefully wrote the Japanese alphabet, with only a single light bulb overhead. I can still see his small, sturdy frame, and the oversized shadow illuminated onto the clothes. His darkly tanned face was wrinkled, like the furrows he created with the tractor. His small eyes squinted, as he was thoroughly absorbed in his writing. His hands were thick and rough, from the many years of farm work and menial labor. Despite many hardships, O-jiichan’s thirst for knowledge was never diminished. Because he hired many Mexican farmhands, he had to learn some Spanish. He also had to repair tractors and other pieces of equipment that occupied a huge A-framed barn. O-jiichan was a successful farmer and well-respected among his fellow Issei friends. I hope my children and grandchildren will appreciate the aspirations of O-jiichan. To honor him, my husband and I named our first-born son, Tory, after O-jiichan: Daisaku is his middle name. Coincidentally, Tory Daisaku is a high school teacher. 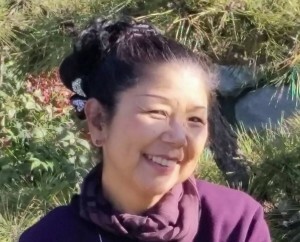 Beverly Toyama is a retired physical therapist who has been very active in the Japanese community. She plans to share her short stories with her family so they can better appreciate their cultural roots and also her own inner feelings. Sansei Stories is an ongoing workshop run by Timothy Toyama at the Gardena Valley Japanese Cultural Institute. For more information, call (310) 324-6611. Opinions expressed are not necessarily those of The Rafu Shimpo.